The needlescopic surgery using instruments with a diameter of 2-mm is devised to leave minimal scarring and reduce the need for postoperative analgesia. For needlescopic lung biopsy for small pulmonary nodule (< 20mm), accurate and convenient method for preoperative localization is necessary. The aim of this study is to evaluate the usefulness of combined mammographic hook wire anchoring and lipiodol injection for localization of small pulmonary nodules before needlescopic lung biopsy. Twenty six small pulmonary nodules in 19 patients (men, 13; age, 55.8+/-13.07 years) were localized preoperatively by using CT-guided hook wire and 0.2ml of lipiodol. A 2-mm needlescope and a 2-mm minisite endograsp were inserted at the sixth intercostal space along the mid and the posterior axillary line, respectively. The site of pulmonary nodules was found by needlescopic detection of a hook wire and their resection margin was decided by lipiodol showed on the C-arm fluoroscopic monitor. A biopsy specimen was obtained using 1 or 2 endostaplers via an 11.5-mm port at the fifth intercostal space along the anterior axillary line. Histopathologic diagnosis was performed immediately after resection. The nodules had an average diameter of 6.7+/-3.27mm (range, 0~16) and were located an average distance of 11.4+/-1.34mm (range, 0~60) from the pleural surface. The radiologic pattern of pulmonary nodule was pure ground glass opacity in 8 cases, pure solid in 11, and mixed type in 7. CT-guided dual localization was successful in all patients without severe complication and all nodules were easy to be detected and resected successfully under needlescopy. 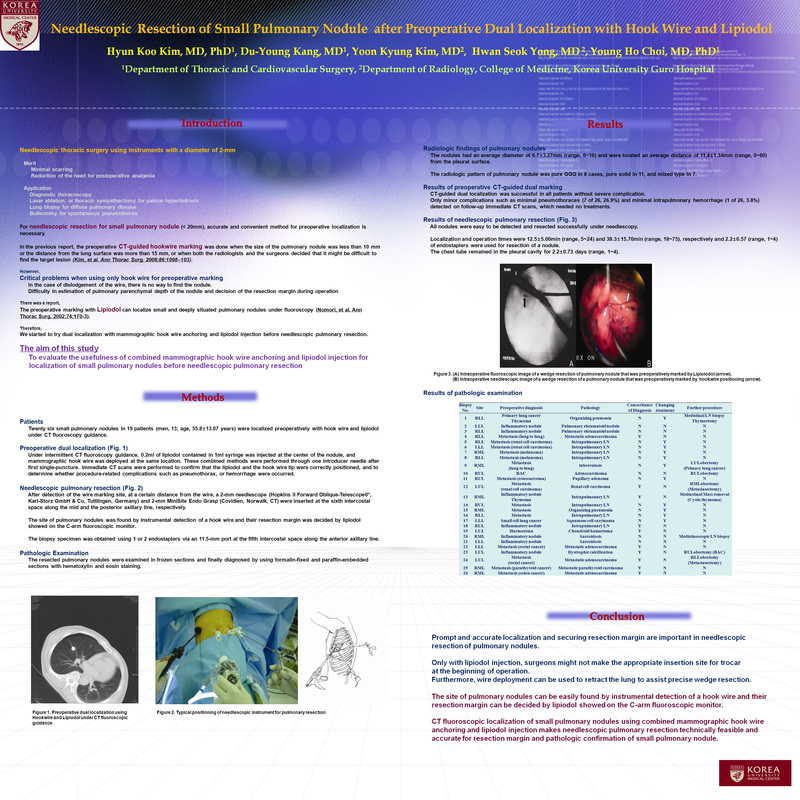 Localization and operation times were 12.5+/-5.00min (range, 5~24) and 38.3+/-15.70min (range, 18~75), respectively and 2.2+/-0.57 (range, 1~4) of endostaplers were used for resection of a nodule. The pathologic diagnosis was benign lesion in 18 cases and malignant lesion in 8. The chest tube remained in the pleural cavity for 2.2+/-0.73 days (range, 1~4). CT fluoroscopic localization of small pulmonary nodules using combined mammographic hook wire anchoring and lipiodol injection makes needlescopic lung biopsy technically feasible and accurate for resection margin and pathologic confirmation of small pulmonary nodule.